At 41 I am quite familiar with my strengths and my weaknesses. I am also quite familiar how I allow my weaknesses to get in the way of my strengths. I allow perfectionism and procrastination to win over good enough and action. Intentions rarely come to fruition. Recent evidence: Instead of using store bought cards for Annelise to write her thank-you notes for birthday presents, I intended to make them using my stamping supplies. But I didn't. I also considered taking pictures of Annelise with each gift and then either including it in the card or making a photo card. But I didn't. Time kept rolling along and I started feeling guiltier and guiltier, but I still didn't make the cards or use ones I had on hand. The other day I couldn't stand the guilt for one more minute. I let Annelise pick which ready-made cards she wanted to use, fortified her with popcorn and had her get busy writing, which she happily did. Soon her notes were ready to be mailed, an embarrassing month later. Why didn't we (and I know it's me) just do that in the first place so her gratitude was expressed promptly instead of tardily? Why do I let perfectionism and procrastination win? 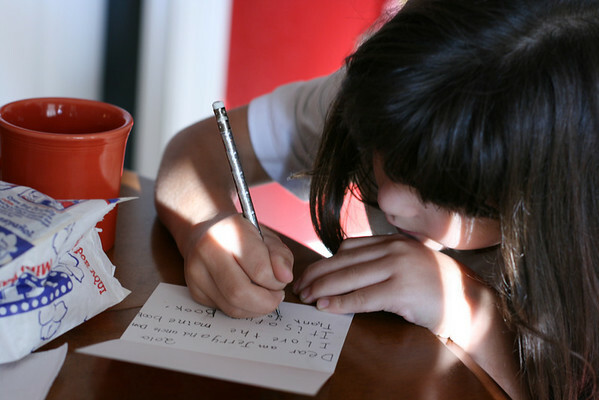 I have done the same thing many times, especially where kid-thank you notes are concerned. I've also gone to the trouble of making photo thank you notes for them to send and then never had them send them. That's even worse!